As a specialty chemical manufacturer, SNP engineers products that meet the specific needs of each and every customer. We work closely with existing and potential customers to design unique polymers for individual applications, and support our unique chemistries by providing technical support and continuous product improvement. SNP Inc. also provides rheology testing and material testing to multiple industries. We are experts in the rheological analysis and profiling of products and raw materials. We offer dynamic and steady rheological testing services at a reasonable price with quick turnaround. 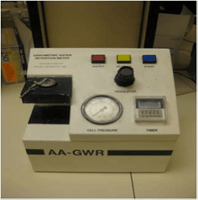 See the testing tools we use below, and contact us today to learn more! Rotational viscometers operate under only one measurable flow condition and relate the torque required to turn an object in a fluid at a known speed to the viscosity of that fluid. The relationship is based on the fluid remaining stationary as an object moves through it, or the object is stationary as the fluid moves past it with the resultant drag caused by relative motion of the fluid and a surface is a measure of the viscosity. The water retention of coatings can be tested statically or dynamically. The water retention is an important characteristic of the coating as the rheology of the coating changes as the free water leaves the coating into the basesheet. The Hercules Hi-Shear Viscometer system measures the flow properties of dispersions and coatings subjected to varying degrees of shear. The Hercules Hi-Shear Viscometer produces continuous results reflecting sample reaction to dynamic shear conditions over time. The shape of the rheogram produced from the Hercules Viscometer can be used to predict flow performance of a material based on changes in shear rate. 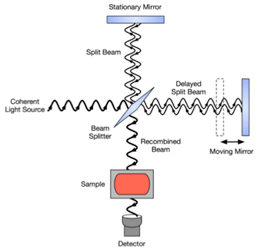 Fourier Transform Infrared (FTIR) Spectroscopy is a measurement technique where infrared light is guided through an interferometer and through the sample. The interferogram representing light output as a function of mirror position is related to IR spectrum by Fourier transformation. This technique measures the types of bonds present in the test specimen. A rheometer is used to measure fluid flow response to applied forces. A rheometer is used when fluids cannot be defined by a single value of viscosity therefore requiring multiple parameters to be defined and measured.